To say that Monty’s has a cult following would be a bit of an understatement. 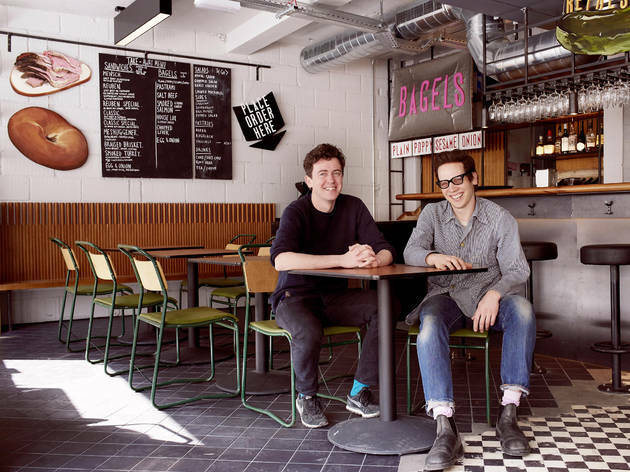 Once a stall at achingly hip Maltby Street Market – where many a street food star is born – it got itself a rep for serving absurdly good salt beef sarnies, long before the reuben became A Thing. Then came a Kickstarter campaign to fund a permanent restaurant. And here, at last, it is. 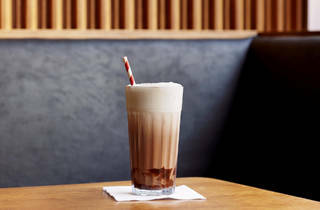 The compact, retro menu echoes those of New York’s kosher-style delis, serving sky-high sarnies – not quite as OTT as across the pond, but still generous – plus chicken soup, bagels, chopped liver, latkes, pastries, salads and sauerkraut. 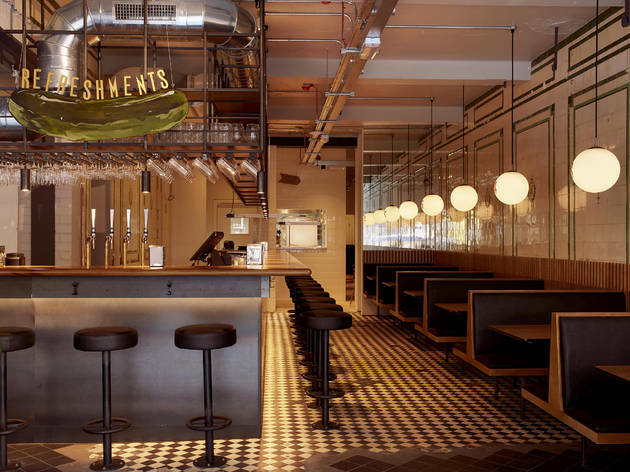 It’s a handsome space, dominated by a long, L-shaped bar and diner-style booths that hug a wall of exposed tiles. Chalked up on the specials board is a turkey schnitzel, served, Holstein-style, with a fried egg. I was tempted. 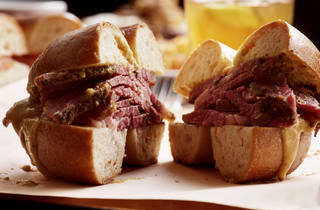 But if this is your first time, order one thing: the salt beef. 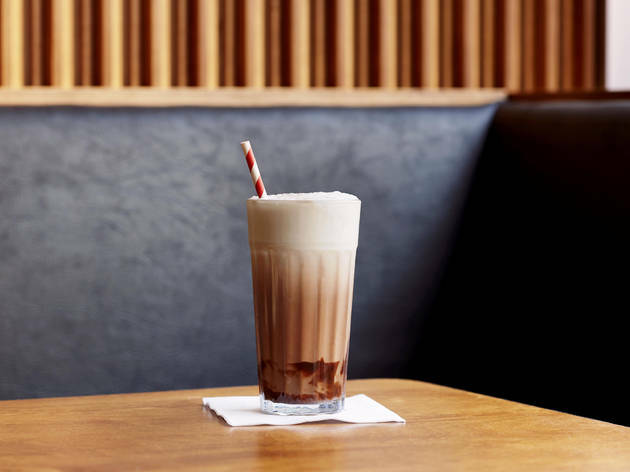 Monty’s is one of the few places in London where they make their own, from scratch, and it shows. They choose the fattiest cuts of brisket, dry cure it for days with their own secret blend of sugars, salts and spices, soak it overnight, then simmer it for hours. It’s salty (but not too salty), fatty (but not too fatty), and soft enough to eat with a spoon. It’s impossibly moreish. It made me want to race into the kitchen, bundle a load into my handbag and run off into the night screaming ‘more for meeeee’. 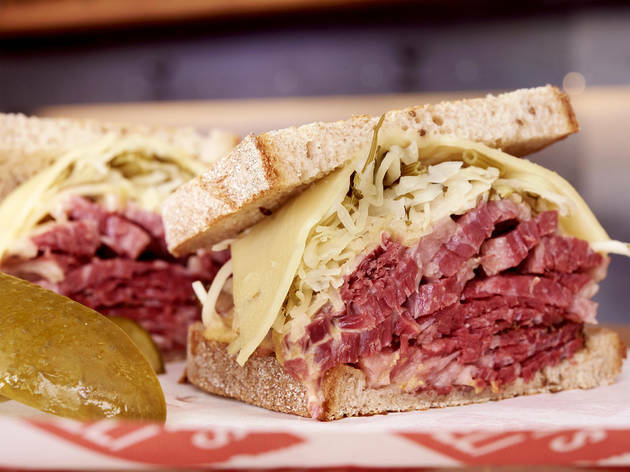 Try some in the signature reuben: toasted rye, melted swiss cheese, a lick of mustard, ‘Russian dressing’ (a piquant mayo-ketchup), a pile of finely shredded kraut, and, finally, lashings of salt beef. It sounds like a lot, but it’s perfection. 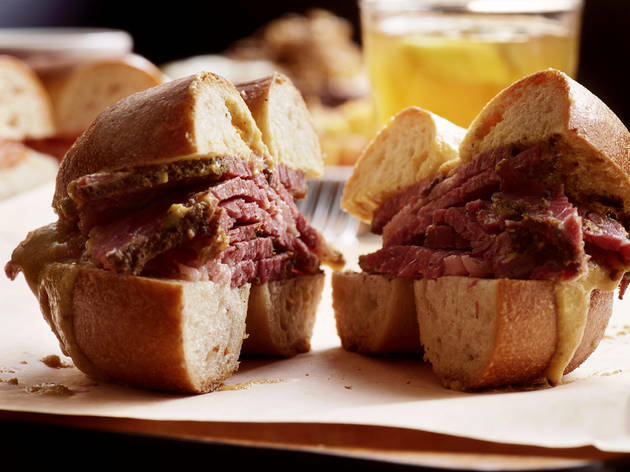 The smoky, peppery pastrami (again, made in-house), is almost as memorable. I had it in a ‘classic’: soft rye bread (this time untoasted, all the better to taste the subtle caraway seeds), more Russian dressing, fresh coleslaw and a heap of thickly-cut pastrami. If you think that you can’t have sarnies for dinner, well, you’re wrong. Salads are good: the modest potato salad especially. But on the night I went in, the kitchen was running low on supplies. Latkes? Sold out. Rugelach? Sold out. Blintzes? Oh, come on! The sweet waitress must have detected my inner #sadface, because a slice of substitute babka (chocolate bread, from the teeny bread-and-bagel counter) came unexpectedly ‘on the house’. And hey, now I’ve got a reason to go back. Greasy, salty chicken wings (but cooked well). Greasy latke. Flavourless dry salt beef. Great chips. Good slaw. Greasy toasted bread with Reuben. Nice wine. Good service. Second time here. Both times the food was a let down. An iconic London sandwich. If you don't like it, we will not get on. 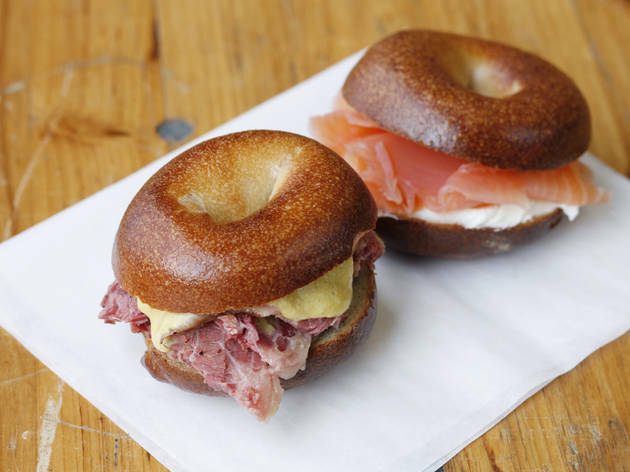 One of the best delis in London with a great brunch menu. The salt Beef and latkes are a must. We decided to visit on the promise of an amazing Ruben, have to say the service was very average and the sandwich was expensive £9.50 all in a ruben + lemon-aide cost me over £14 - perhaps this is for rich hipsters with no taste buds? 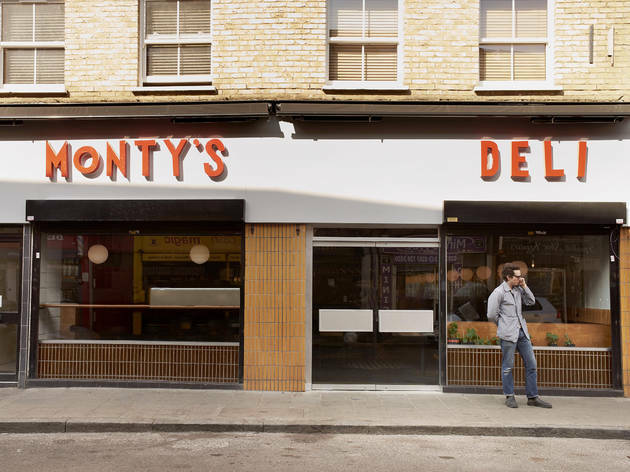 We were bummed when Monty's closed at Maltby Street. Those times when the queue was not out the door it was so great having their deliciously flavourful salt beef or reuben sandwiches. 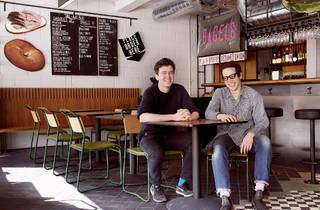 Imagine how happy I was when I finally got to go to their actual establishment in Hoxton. The food did not disappoint. Piles of salt beef and pastrami smooshed on rye bread. The sauerkraut and cheese cut through nicely. Pickles were fantastic... so fantastic I stole my friends. I have no regrets. Oh and go for happy hour when its buy one get one. Worth it. As a Jewish girl and being brought up on Jewish soul food, I was super excited to hear about Monyts Deli! My parents were visiting me for the weekend and my dad wanted to go somewhere for a Jewish style brunch and I thought this would be a great opportunity to visit this cool deli/dinner and to satisfy my dads salt beef cravings. 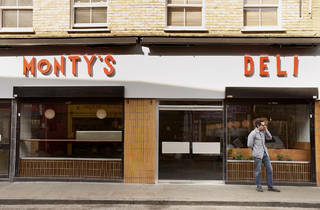 Located approx 8 mins from Hoxton station, there lies Montys Deli. The decor isnt fancy, but holds a lot of character as the original tiles from what seems to be an old butchers, still remain. This place remains me being in a deli in down town New York. I must say this place is for meal lovers (sorry veggie guys who are reading this) as this deli produces sandwiches which are piled high with the likes of salt beef, pastrami, chopped liver, cheese and coleslaw. We all went for the Meshuggner, which consisted of all the above (we shouldnt choose what we wanted so this fulfilled all our meaty needs). This sandwich is the king of all sandwiches. 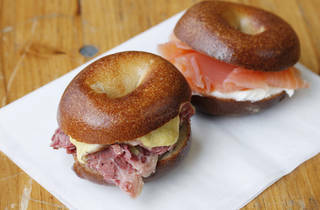 For a taste of Jewish soul food and great sandwiches, this really is the best place to go. They also do a traditional Shabbat meal meal on a Friday, which I cant wait to try out! The decor in Monty’s Deli is kind of industrial cafeteria style, but I quite like it. 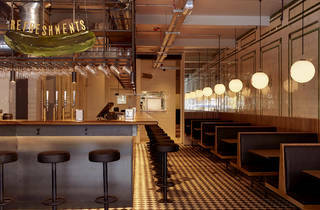 There are very old looking green and white tiles on the walls, light coloured wood furniture and retro orb lights above each booth with a big red number painted on each one. 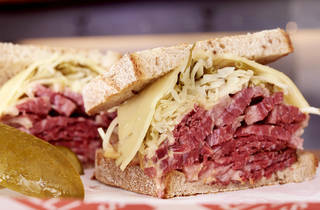 The specialty at Monty’s is salt beef and pastrami. They do lots of different sandwiches using bread or bagels and also have some great sides. Being vegetarian, I went for the potato latkes, pickles and fennel salad. I really enjoyed the latkes and pickles, but the fennel salad lacked flavour. As well as lunch and dinner items, they also had two brunch specials on the day that I went - challah french toast and salt beef hash. The staff were incredibly friendly and mentioned that everything is baked, pickled, cured, etc. on site. On a Friday at lunch time the restaurant was very quiet, but I was told that weekends are non-stop busy. Although I didn’t have a bagel sandwich to eat in, they looked so tempting that I got six to take away, costing £5. The whole menu can be done as take away too. Visited Monty's Deli this last weekend, and it was just delightful! Friend and I got a pastrami and roast beef each so that we could share, and it was incredibly delicious. The pastrami and roast beef were very tender and mixed well with melted cheese. Even really enjoyed the pickle - sorry, Gherkin - on my plate! The venue itself is pretty cool, owning itself to a cool 1920's New York style. Quite enjoyed sitting at the bar, as well, which isn't that common in London. Overall food was excellent, staff were friendly and was reasonably well-priced. Well worth a visit!